Immer wieder habe ich bei bto Studien zitiert, die in der hohen Unternehmensverschuldung den nächsten Krisenherd sehen. Sogar der IWF sieht in den hohen Schulden der US-Unternehmen einen möglichen Auslöser für die nächste Finanzkrise. „After the 2008 financial crisis, many observers expected global debt levels to decline. However, while the household sector globally has reduced its debt relative to GDP, total debt, which includes household, nonfinancial corporate, and government debt, has continued to creep upward. 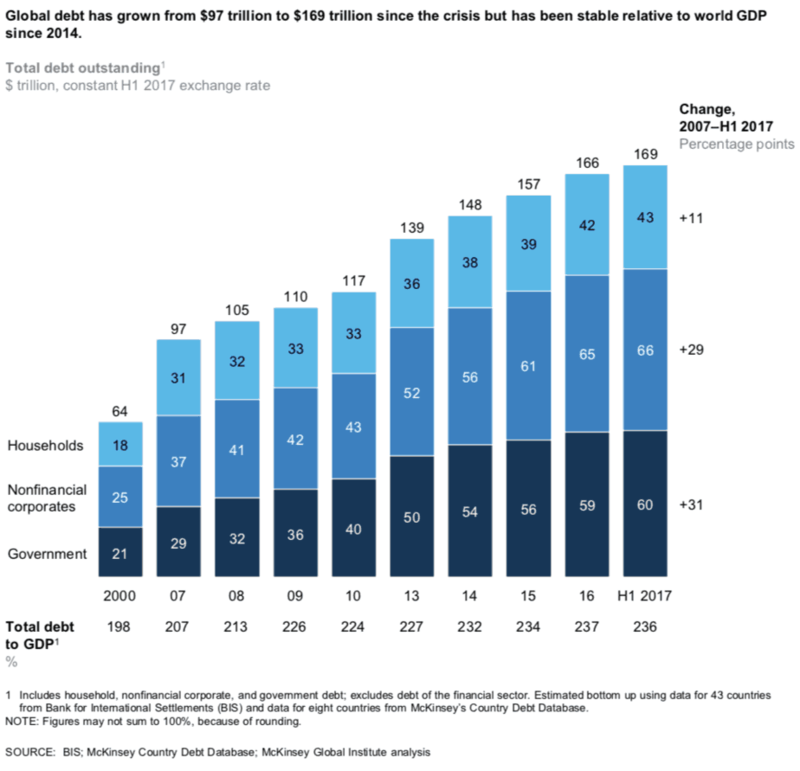 Total debt reached $169 trillion by the middle of 2017, a 74 percent increase from where it stood on the eve of the crisis.“ – bto: soweit bekannt. McKinsey dürfte heute zu einer der globalen Autoritäten zum Thema Verschuldung gehören. Die Autoren betonen zwar, dass die Schulden relativ zum BIP seit 2014 nicht mehr weiter angestiegen sind, fokussieren dann aber auf Unternehmensschulden: „Global nonfinancial corporate debt, including bonds and loans, more than doubled over the past decade, growing by $37 trillion to reach $66 trillion in mid-2017. This growth was nearly as much as the increase in government debt of $31 trillion over this period.“ – bto: was kein Problem sein muss, weil es ja im produktiven Sektor der Wirtschaft passiert, könnte man argumentieren. 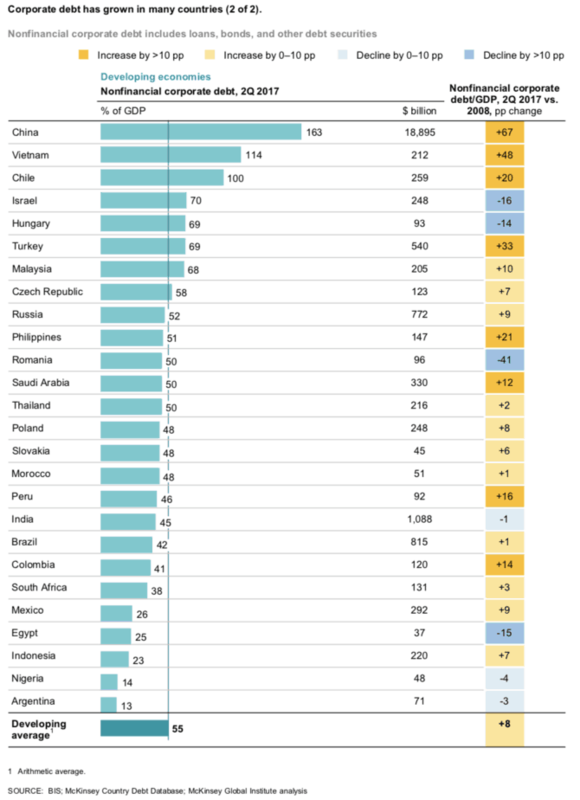 „Companies in advanced economies accounted for just 34 percent or $9.9 trillion of the growth in global corporate debt since 2007, while developing countries accounted for 66 percent or $19.2 trillion. Since 2007, China’s corporate debt has increased by $15 trillion, or more than half of global corporate debt growth. As a share of GDP, China’s corporate debt rose from 97 percent of GDP in 2007 to 163 percent in 2017, one of the highest corporate debt ratios in the world apart from small financial centers that attract offshore companies. The growth in corporate debt in China is mainly associated with a construction sector that increased its leverage as the housing market boomed. Today, 30 to 35 percent of corporate debt in China is associated with construction and real estate.“ – bto: Das sind gute Nachrichten. Die Unternehmensschulden sind vor allem in China gestiegen. Sie konzentrieren sich auf den Immobiliensektor. Das sollte eine zentral geführte Volkswirtschaft doch locker bewältigen können, wenn man sich vorstellt, wie eine dezentrale Wirtschaft wie die USA ein ähnliches Problem gelöst hat. Wir könnten hier also aufhören zu lesen. „(…) Chile, Peru, the Philippines, Turkey, and Vietnam stand out (Exhibit 2). Another notable feature of corporate debt in developing economies is that a large share is denominated in foreign currency. For instance, around half of corporate debt in Hungary, Indonesia, and Turkey is denominated in US dollars and other foreign currencies. Both rapid growth in the level of corporate debt and exposure to exchange rate fluctuations make corporate sectors in developing countries particularly vulnerable to economic shocks.“ – bto: Auch dieses Problem im Griff zu haben, gilt aber eben für China nicht. Schwer vorstellbar, dass die anderen Länder eine neue Finanzkrise auslösen können. „(…) in recent years has been a shift in corporate borrowing from loans to bonds. (…) the share of global corporate debt in the form of bonds has nearly doubled, and the value of corporate bonds outstanding has grown 2.7 times since 2007. This is a positive trend, leading to a diversification of corporate financing.“ – bto: hm. Wie wir bei den Diskussionen zu Leveraged Loans gesehen haben, sind die Käufer dieser Papiere sich der Risiken vermutlich nicht bewusst. Deshalb bestehen hier meines Erachtens deutliche Risiken, die man nicht unterschätzen sollte. rated BBB, just a few steps above noninvestment grade, up from 22 percent in 1990 and 31 percent in 2000, according to Morgan Stanley. Overall, BBB-rated US nonfinancial corporate bonds outstanding total $1.9 trillion — almost twice the size of the high-yield bond market (Exhibit 4). Issuers are also more heavily indebted than before. The net leverage ratio for BBB issuers rose from 1.7 in 2000 to 2.9 in 2017, according to PIMCO.“ – bto: Und die Gefahr besteht, dass es zu einer Welle an Herabstufungen kommt im Falle einer Rezession. Wie bei bto diskutiert, sind die Ratings ohnehin besser als fundamental gerechtfertigt. Die Ratingagenturen werden also erst reagieren, wenn es schon zu spät ist. 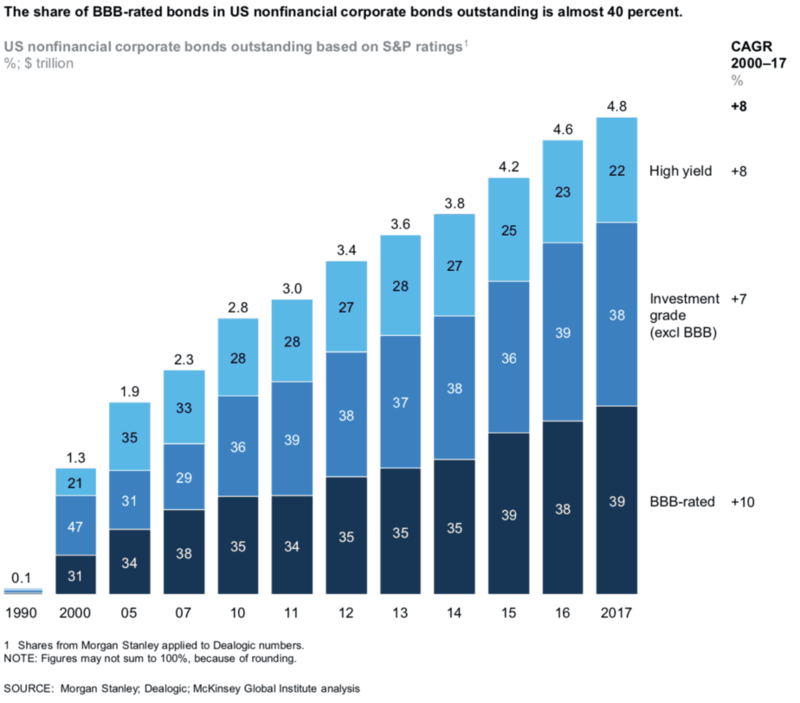 „Globally, the value of corporate high-yield bonds outstanding increased from $500 billion in 2007 to $1.9 trillion in 2017.The latter figure represents 29 percent of corporate bonds that have credit ratings. In 2017, 43 percent of bonds were not rated by the major agencies, typically because they were from smaller companies or were private placements.“ – bto: alles Zeichen für ein verstecktes Problem, das akut werden könnte, sobald die Konjunktur sich verschlechtert und die Zinsen steigen. „In the United States, for instance, the share of maturing bonds that are high yield is expected to grow from 11 percent in 2017 to 27 percent in 2020. The absolute amount—at least $180 billion of high-yield bonds coming due in 2020 — will be almost three times the amount in 2017. If current high-yield issuance trends continue, that share will rise even more. (…) The amount of high-yield bonds in need of refinancing could create problems in some sectors and among weak performers. (…) Investor wariness about refinancing high-yield bonds in the coming years could force bankruptcies.“ – bto: Und die haben realwirtschaftliche Konsequenzen. 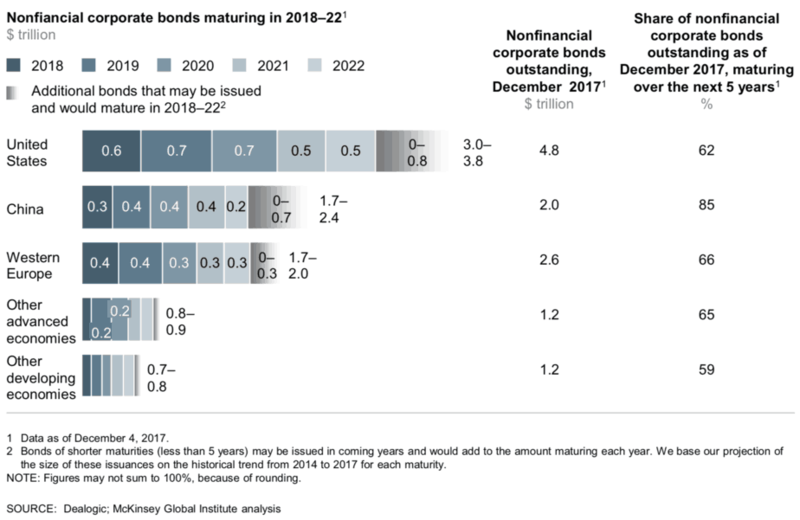 „From 2018 to 2022, a record amount of bonds—between $1.6 trillion and $2.1 trillion annually — will mature. Globally, a total of $7.9 trillion of bonds will come due during those five years, based on bonds already issued. However, some bonds have maturities of less than five years and may still be issued and come due during that period. If current issuance trends continue, then as much as $10 trillion of bonds will come due over the next five years. At least $3 trillion of this total will be from US corporations, $1.7 trillion from Chinese companies, and $1.7 trillion from Western European companies.“ – bto: Das ist kein Problem, solange die Investoren bereit sind, diese Refinanzierung zu übernehmen und dabei die Zinslast nicht steigt. Zwei potenzielle Risiken. Die höhere Verschuldung war nur möglich, weil die Unternehmensgewinne entsprechend gestiegen sind: „Corporate profits are at or near historical highs after three decades of growth. Earnings before interest and taxes of all global corporations more than tripled in real terms between 1980 and 2013. 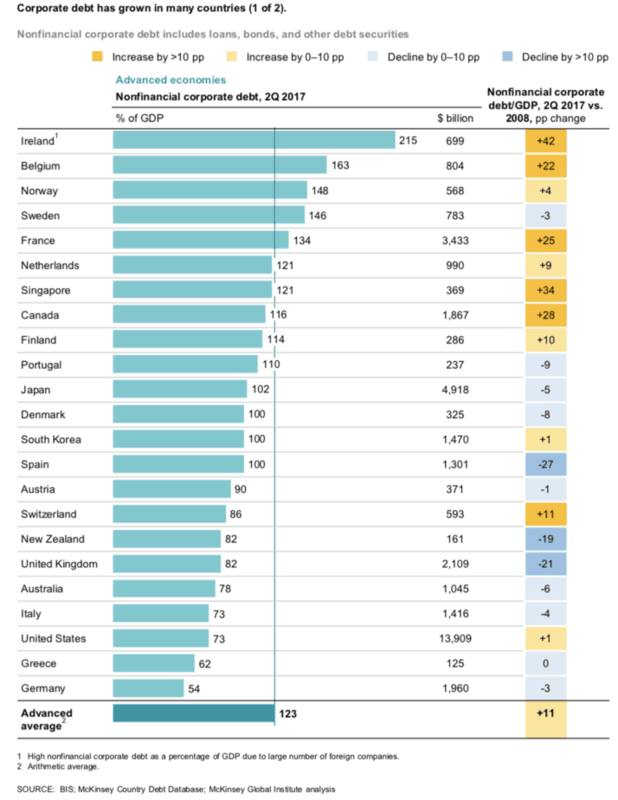 Globally, corporations made a combined profit of $7.2 trillion, or 9.8 percent of GDP, in 2013—a record.This has given most companies ample financial capacity to finance their growing leverage.“ – bto: Das wirft auch die Frage auf, wie nachhaltig das sein kann, geht es doch zu Lasten der Arbeitnehmer. „MGI research suggests that the global profit outlook could come under pressure as competition intensifies when new players, especially from developing countries, and entrepreneurial tech-enabled companies come into the frame. Due to growing competition in a variety of industries, the corporate profit pool could decrease from 10 percent of global GDP to around 8 percent by 2025.“ – bto: Das kann sein, muss nicht sein. Ich denke, dass Hauptrisiko ergibt sich aus der Abhängigkeit der Welt von tiefen Zinsen. Kommt es zu einem externen Schock, ist es leicht möglich, dass es zu einer Panik an den Märkten kommt. 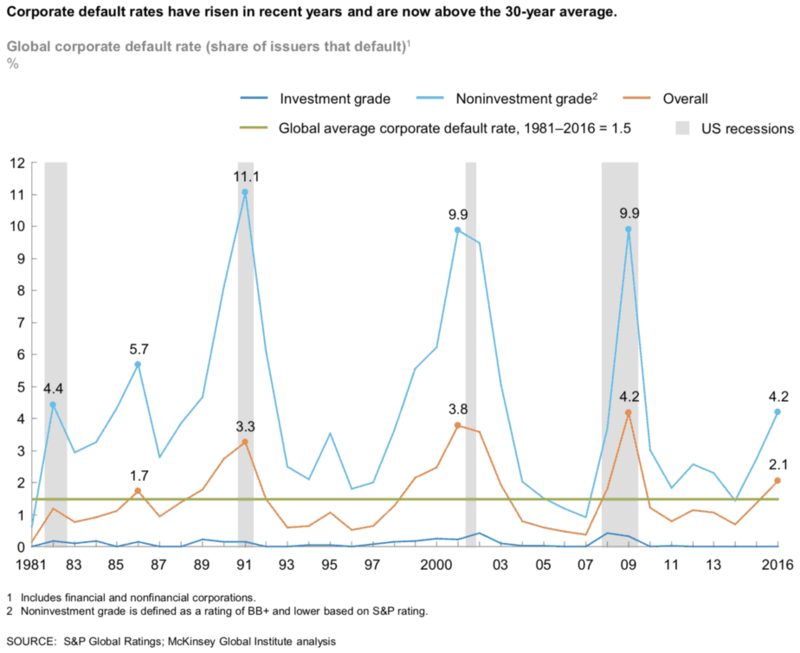 „Meanwhile, the global corporate default rate on financial obligations (calculated by S&P Global Ratings as the percentage of issuers that defaulted on one or more financial obligations) rose to 2.1 percent in 2016, above the long-term average of 1.5 percent since 1981.“ – bto: und dies, obwohl die Zinsen historisch tief sind und die Banken – zumindest in Europa – eine Zombifizierung zulassen und fördern! „To assess potential risks in the corporate bond market as record numbers of bonds mature and need to be refinanced, we calculated the interest coverage ratio, a metric of corporate financial performance, for all bond issuers in a sample of countries. (…) We find that the share of bonds potentially at risk of default rises significantly in a scenario in which interest rates rise.“ – bto: weshalb sie eben auch nicht steigen dürfen. McKinsey verweist dann auf einen wichtigen Punkt, der – egal wie negativ ich auch immer argumentieren möchte – positiv ist. Die Probleme zu hoher Verschuldung sind konzentriert auf einzelne Sektoren: „In the United States, for instance, companies whose interest coverage ratio is below the 1.5 threshold account for 18 percent of the value of bonds outstanding in the energy sector, or $104 billion. (…) In China, one-third of bonds issued by industrial companies (worth $250 billion) and 28 percent of bonds issued by real estate companies ($104 billion) are from issuers with an interest coverage ratio below the 1.5 threshold. Chinese real estate companies have borrowed large amounts over the past few years to finance a construction boom, and concern that China is now experiencing a housing bubble is rising. Although authorities have taken a range of measures to cool the housing market and reduce the risk, for instance tightening mortgage and reselling conditions for home buyers, bond defaults in the sector have risen, and there is a risk of more as the construction sector cools further.“ – bto: Aber bei China denke ich, dass das Land genug Hebel hat, um damit umzugehen. Damit gibt es keinen Crash, aber geringeres Wachstum, was bereits negativ auf die Weltwirtschaft und gerade Exporteure wie Deutschland auswirkt. Sodann kommt auch noch eine weitere Entwarnung von McKinsey: „We simulated the impact that higher interest rates could have on the interest coverage ratio of companies, and modeled increases by 100 basis points and by 200 basis points. We find that in advanced economies, the impact of rising interest rates on companies’ ability to service their debt will likely be modest. In developing countries, it could raise the portion of bonds at risk of default even higher.“ – bto: Und da es sich dabei vor allem um China handelt, ist das auch problemlos. So kommen wir zu einem für bto ungewöhnlich optimistischem Fazit. Es mag hier und da einzelne Problembereiche geben, aber keinen Anlass, eine systemische Krise aufgrund der Unternehmensverschuldung zu erwarten. Käme es zu einer Welle an Herabstufungen mag das anders sein, wie ich mehrfach diskutiert habe. Die Studie von McKinsey stützt derartige Sorgen aber nicht. die Zahlen von McKinsey sind offensichtlich zu alt um noch aussagekräftig zu sein, denn es wäre nicht das erste Mal, dass in zwei Jahren massive Veränderungen eintreten, wie folgende Grafik des börsengelisteten Reseach-Dienstleisters Creditriskmonitor zeigt. Bravo, schön auch mal ein positives Fazit auf bto zu lesen! Das würde ich gerne viel häufiger tun, denn insgesamt läuft in der Welt und auch in Deutschland entgegen landläufiger Meinung noch vieles richtig. Naja, wenn Sie Jubelmeldungen hören möchten, gibt es dafür nun wirklich schon genug Anbieter. Alleine Dutzende von ihnen muss ich jeden Monat mit einem „Beitrag“ von 17,50 EUR unterstützen, ob ich will oder nicht. Diese Modellierungen würde ich gerne mal sehen, besonders die Grundannahmen über die Firmen in dem Modell. Die Schlussfolgerung, dass ein Zinsanstieg kaum Einfluss auf die Schuldentragfähigkeit der Unternehmen habe, passt überhaupt nicht zu der These von der „Zombifizierung“ von Firmen. Zumindest die Zombies müssten bei 100-200 bps Zinsanstieg in echte Existenzschwierigkeiten kommen. Hier können Sie „Jubelmeldungen hören“ und sogar sehen: https://youtu.be/ZNzvIY-BrVk, müssen es aber selbstverständlich nicht. Ich teile hier die Einschätzung von Ulrich Bindseil gegenüber Markus Krall: Diese These ist selber ein Zombie. vielen Dank für das Video, es sieht auf den ersten Blick sehr interessant aus und ich werde es mir nachher einmal anschauen. In allen Projekten, die ich mit McKinsey gemacht habe, bin ich auf überaus kompetente Kollegen gestoßen. Daher habe ich keine Bedenken, dass sie richtig modellieren können – spreche Ihnen die Skepsis aber natürlich nicht ab, das ist Ihr gutes Recht. Kommt als nächstes ein Interview-Spezial mit Thilo Sarrazin um 03:15 Uhr nachts an einem Werktag, oder ist das dem öffentlich-rechtlichen Rundfunk dann doch zu gewagt? Ich glaube, die Leute bei McKinsey können so gut modellieren, dass sie jedes gewünschte Ergebnis einer Modellrechnung durch entsprechende Änderungen an den Ausgangsbedingungen und dem Modell selbst goalseeken können, passend gemacht je nach Auftraggeber beziehungsweise je nach eigenen strategischen Zielen. Deshalb interessiert mich ja, unter welchen Annahmen die auf das Ergebnis kommen, dass eine Zinserhöhung kaum Unternehmen in Schwierigkeiten bringt. Suchen Sie einfach mal bei YouTube nach Mausfeld und schauen sich die Aufrufe an. In Summe deutlich über 2 Mio. Mir erschließt sich nicht, warum eine hohe Sektorverschuldung per se positive sein soll. Angenommen die Bonds von amerikanischen Energieunternehmen der fracking industry lägen überproportional in bestimmten auf high yield ausgerichteten Portfolios, dann würde dort ein Klumpenrisiko bestehen, wenn diese Energieunternehmen z. B. wegen eines niedrigen Ölpreises in Schwierigkeiten geräten. Das könnte negative Weiterungen auslösen, etwa wenn derartige Bonds verkauft werden müssten, die Renditen steigen würden und sich dadurch die Refinanzierungskosten für dies Unternehmen erhöhen würden. Das würde dann auch Banken, die auf sich auf die Finanzierung des Energiesektors spezialisiert haben, sehr stark negativ treffen. Kurzum, ich sehe nicht, dass es so etwas wie Quarantäne im Finanzsektor gibt. EVs und ihre Bedeutung für den Standort Deutschland waren hier ja immer wieder mal Thema. Interessant an dem Bericht finde ich u. a., dass die Amortisationsdauer für den EU-Strommix mit knapp 2,8 Jahren UNTER der für den deutschen mit 3,6 Jahren liegt. Da ich nicht davon ausgehe, dass der EU-Strommix durch Wasserkraft, Photovoltaik- oder Windkraftanlagen umweltfreundlicher als der deutsche ist, kann es nur Kernkraft sein. Das wird so sein, ohne jetzt genau die Zahlen zu suchen. Danke fürs Verlinken des Spektrumartikels. Solche Studien kommen in letzter Zeit vermehrt auf. Sogar der ADAC schreibt im aktuellen Heft, dass den E-Auto-Skeptikern schon langsam die Argumente ausgehen. Das Ganze ist auch nicht verwunderlich, wenn man bedenkt, dass die Automobilindustrie gerade Mrd. Beträge in die E-Mobilität investiert. Beim deutschen Strommix entstehen ca. 500 g CO2 pro kWh. Der Verbrauch (inkl. Ladeverluste) der aktuellen E-Autos (Renault Zoe – Jaguar i-Pace) liegt laut ADAC im Bereich von 20 – 27 kWh/100 km. Das ergibt einen CO2 Ausstoß pro km von 100 – 135 g.
In den Studien können die Ergebnisse sehr leicht durch die getroffenen Annahmen in die gewünschte Richtung gelenkt werden. So wird die Betrachtung oft bei einer Kilometerleistung von 150.000 abgebrochen, da beim E-Auto dann ein neuer Akku fällig wird. Ein effizienter Diesel hingegen fährt mit dem gleichen Tank mehr als 300.000 km weit. Wie bei Energiewendeforschern üblich, werden weder die Kosten noch die zusätzlichen CO2-Emissionen für den notwendigen Ausbau der Erneuerbaren Energien berücksichtigt. Die Anlagen und die Speicher (welche?) sind einfach da, werden wie bei der MMT einfach aus dem Nichts geschaffen (so erklärt sich wahrscheinlich auch die Sympathie der MMT´ler für die Energiewende). Abgesehen von den sehr zweifelhaften Vorteilen für die Umwelt, sind die Hauptprobleme der E-Mobilität die geringe Reichweite und die fehlende Wirtschaftlichkeit. So kostet ein Renault Zoe mit 41 kWh-Akku (Reichweite im Winter kleiner als 150 km) ca. 24.000,-€. Dazu kommt noch eine Akku-Miete von 59,-€ monatlich für 7.500 km im Jahr. Jeder zusätzlich gefahrene Kilometer wird mit 0,05 € berechnet. Nimmt man eine monatliche Fahrstrecke von 1200 km an, ergeben sich 1053,-€ Akku-Miete/ Jahr und entsprechende Kosten von 7,3 € pro 100 km. Hinzu kommen noch die tendenziell steigenden Kosten für den Stromverbrauch (0,29 € x 20 kWh) von 5,8 €. In Summe ergeben sich Kosten in Höhe von ca. 13 € pro 100 km. Dazu kommt noch ein im Vergleich zu einem Verbrenner doppelt so hoher Reifenabrieb (Gewicht + Beschleunigung; Feinstaub! Ruß! ), so dass sich auch die Reifenkosten verdoppeln. Die verbrenner-spezifischen Wartungskosten (Ölwechsel, Luftfilter, Zahnriemen alle 150.000 km usw.) müssen also mehr als ca. 1000,-€ pro Jahr betragen, damit sich ein E-Auto bei einer Fahrleistung von 1200 km im Monat rechnet. Der Vorteil der E-Mobilität für das Klima ist beim aktuellen deutschen Strommix sehr fraglich. Werden mit dem E-Auto nur wenige km im Monat gefahren, gibt es keinen Vorteil für die Umwelt, wohingegen für Vielfahrer das E-Auto weder wirtschaftlich noch praxistauglich ist. Zumindest der Spiegel hat mit seinem „Fall Relotius“ deutlich gemacht, dass er unsauber recherchierende Redakteure bereitwillig „vor den Bus wirft“.